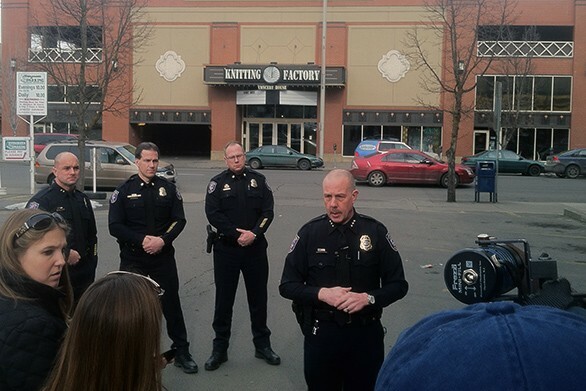 Spokane Police Chief Frank Straub speaks to the media outside the Knitting Factory. Exercising a rarely used authority, Spokane Police Chief Frank Straub today ordered the downtown Knitting Factory concert venue shut down immediately in the wake of two overnight "gang-related" shootings. Police responded to two separate shootings early this morning that left four men hospitalized with non-life threatening injuries. The first occurred outside the Knitting Factory. Another was reported 30 minutes later along the 1700 block of North Maple Street. Straub says the shootings mark the lastest incidents in a recent uptick in gang-related violence. "We are not going to tolerate this kind of violence in our community," he says. Straub, speaking from a parking lot across from the Knitting Factory, says the downtown venue has had connections to four shootings in the past year. The venue has also struggled with numerous reports of fights, medical calls and other disturbances. This morning's shooting reportedly occurred following a private birthday party for local DJ Freaky Fred. The chief says he notified the managers this morning that they would be shut down immediately. The concert house, one of the city's largest, has 20 days to appeal the order. "Our goal here is to bring them to the table," he says of the order. "We deplore the two incidents that took place near our venue and in Spokane this morning. We have strong security measures in place to ensure the safety of both our patrons and performing artists while attending and performing shows at the Knitting Factory. While it’s far more difficult to control what might happen outside the venue — and in this case, a parking lot not owned or controlled by the Knitting Factory — we are working with the Spokane Police Department, the Mayor’s office and the city to both cooperate fully with the investigation of the shootings and to do all we can do contribute to a culture of non-violence in music and entertainment." The venue also announced the cancelation of this Friday's concert as part of a "cooling off" gesture. The company did not mention any additional cancelations. Straub added that, despite recent violence, the downtown area has seen a 10.5 percent drop in property and violent crime in recent weeks. He pledged to continue an "aggressive" crackdown on local gang activity. Some of the upcoming Knitting Factory shows that could be jeopardized include: Rev. Horton Heat on Feb. 28, Chris Webby on March 2, Tyrone Wells on March 3 and Owl City on March 10.